I am a big fan of urban art, stenciling and graffiti. I especially love to spot clever pieces, like this one, which is currently in the east side of the underpass on Brock just north of Queen West. The bling-y gold spray paint is the perfect touch for the couple it references. 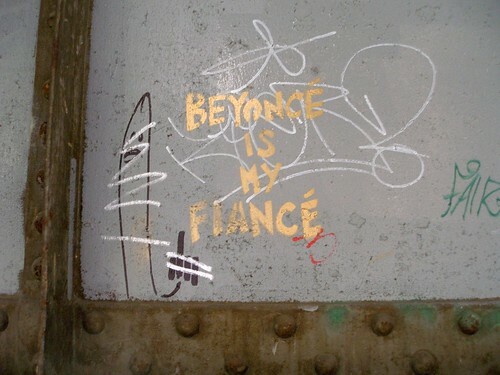 I was looking up the history on the word, fiancé, and just learned that the phrase ‘Beyoncé is my fiancé’ is technically incorrect. When referring to a woman who is engaged the proper term is ‘fiancée’, the former refers to a man who is engaged. I did not know that. Will you be in New York on September 6th? You may want to join in on this performance art piece that will re-create the parade scene from Ferris Beuller’s Day Off. Um, how cool is that? What is it about things that are tiny? Slinkachu works on a small scale, really small. He creates little scenes using tiny people set in our large scale urban setting. The project is appropriately called ‘Little People’. His newer, sister project is called, ‘Inner City Snail’. It documents snails that he as altered slightly (but not harmed) and released into the world. I would love to stumble upon one of these works of art on my way to work. well actually it’s ‘fiancée’ not ‘finacée’ – the a and n are reversed, but i see that all the time. i was also going to ask, i really love the light fixture in the bathroom with a window in the shop. where did you get all of those connectors to make the light fixture? i was thinking of copying you in my apartment, i think it would fit right in. angelune – oops! i just fixed that typo. yeah, that light is really easy to make. i buy the connectors at home depot, but i just saw them at home hardware down the street from here. you can just infinitely connect them together, it’s SO easy. man, i have totally had miniatures on the brain lately. how did you know? ever since i took these pictures at the creation museum, i have been trying to remember who the miniature artists of the world are. and then yesterday i went to a miniature diorama in georgia! what gives? becky – miniatures are the coolest. when i was younger i was obsessed with dollhouses and miniatures. i recently bought a photo of James Spicer’s depicting a miniature city scene. Cool blog! I dont think Ive seen all the angles of this subject the way youve cleared them out. Youre a true star, a rock star man. Youve got so much to say and have a lot of knowledge about the subject that I think you should just teach a class about it…HaHa!